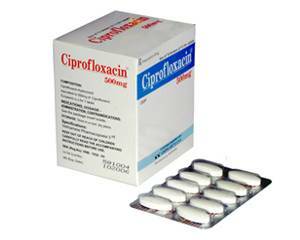 Ciprofloxacin is a type of medicine called a fluoroquinolone antibiotic. The active ingredient, ciprofloxacin, works by killing the bacteria that cause gastrointestinal infections (travellers' diarrhoea), urinary infections and other bacterial infections, thereby reducing symptoms such as diarrhoea, pain and fever. Ciprofloxacin is a prescription-only medicine. Infections of the joints and bones. Ciprofloxacin tablets should be swallowed whole and not chewed. It is important to drink plenty of fluid while taking this medicine. Do not take dairy products (e.g. milk, yoghurt, cheese) at the same time as Ciprofloxacin. This is because these can reduce the absorption of the antibiotic from the gut. Always finish the entire course, even if you feel better. Stopping the course too soon may cause the infection to return. In general, Ciprofloxacin is given as a 5 to 21-day course, depending on the symptoms. 100 mg to 750 mg twice a day for as long as the doctor prescribes. This medicine should only be used in children and young people on advice of a doctor. In this case, the doctor will prescribe an adjusted dose. Read the package leaflet before use. You are taking a muscle relaxant called Tizanidine. Consult a doctor on the use of Ciprofloxacin if you have epilepsy, diabetes, cardiac arrhythmia, abnormal muscle weakness (myasthenia gravis) or other health problems. Ciprofloxacin may interact with other medicines. It is therefore important to tell the doctor what other medicines you are taking when you order. Do not use Ciprofloxacin if you are pregnant or breastfeeding, unless otherwise advised by your doctor. This medicine may affect your ability to react. Stay out of traffic if you are less alert. Alcohol may trigger or intensify the side effects. It is therefore important to reduce or stop alcohol consumption while taking this medicine.